Barnhart Specialty Contracting is an expertly-trained Licensed Applicator for Hacker Industries FIRM-FILL® gypsum concrete and cementitious floor underlayments and sound control mats. We proudly serve the state of Kansas, Kansas City, NW Missouri and SE Nebraska with floor levelers, underlayments and concrete toppings. Typical reasons for using Hacker FIRM-FILL® gypsum concretes and cementious underlayments include Fire-resistance, Radiant Heat Fill, Floor Leveling, and Sound Insulating. Architectural firms typically use one of the 86 UL listings on their projects. 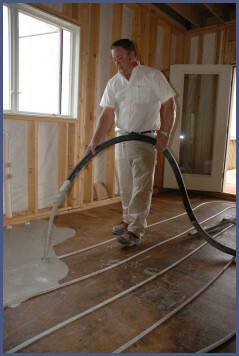 Because of their quick, cost-effective installation, light weight and excellent performance characteristics, poured gypsum floor underlayments - typically referred to as gypcrete (generic) - have emerged as a leading choice for a wide range of commercial, institutional, residential and renovation applications. Gypsum concrete underlayments bond strongly to existing concrete and other floor surfaces, and require minimal surface preparation. This makes gypsum concrete underlayment the quickest and most cost-efficient option for transforming worn, cracked and uneven floors into smooth, high-strength surfaces ready for the application of finish materials. Contact Barnhart Specialty Contracting today and see how gypsum concrete flooring can benefit your next project.